The Firehole Ranch lodge envelopes visitors in a cool quietness, its massive log structure insulating the interior from the summer heat and dampening any hint of sound. A towering rock fireplace anchors a rustic sitting room where countless fish stories have surely been told. Just behind the hearth the lodge opens to a dining hall running the length of the building. A wall of windows frame a mountain-wrapped lake scene providing an ever transforming backdrop for elegant meals prepared by a classically trained French chef. As a perfect mountain summer day winds down, the silence of the lodge is shattered by the excited chatter of fly fishing guides gathering after a long day on the river. Talk of water levels, insect hatches, and weather are punctuated by exclamations of approval as each guide selects and shows off the flies they intend to use the next day—flies they spent their winters tieing after months of studying the preferred meals of the finicky trout they pursue. Polished gem. 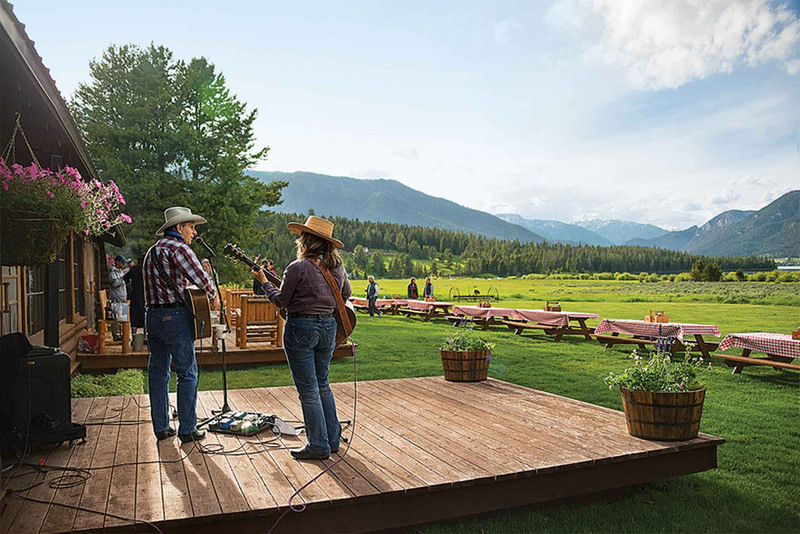 Over the decades, the Firehole Ranch has oscillated from grandeur to decay and now, under the critical supervision of owner Lyndy Caine, back to grandeur once again as an elegantly rustic fly fishing lodge. 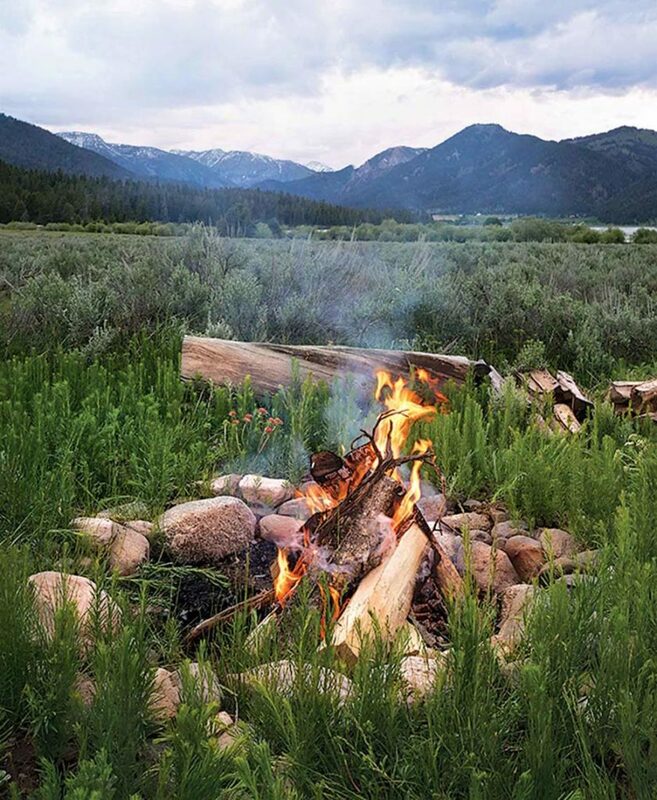 In its earliest days it was a cow camp for a cattle baron, was opened for homesteading after the construction of Hebgen Dam flooded much of the area, then reborn as a dude ranch providing excursions to nearby Yellowstone Park and eventually a fly fishing retreat. Caine spent summers at her grandparents’ cabin—a fine establishment boasting of both a girls and boys outhouse—neighboring the Firehole Ranch. In 1999, Caine was a single mother of a 3-year-old moving to Bozeman, Montana, when she heard the ranch was for sale. Owned by big city lawyers, it was subdivided and the buildings were in need of attention. “I grew up watching the elk come to the ranch to have their calves each spring and I just couldn’t imagine the whole waterfront covered in houses,” Caine recounts, dismay entering her tone. 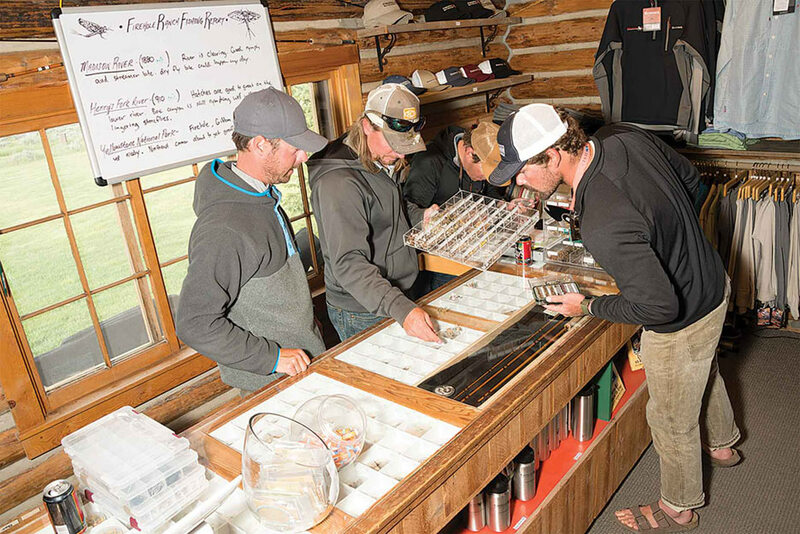 Head guide, Josh Duchateau (far left in group), started as a dishwasher at the Firehole Ranch but was given the opportunity to turn his passion for fishing into a rewarding career. She meticulously restored the aging buildings. “The lodge was rotting into the ground. I was either going to have to get all short guests and staff or do something.” She hired engineers, tunneling under the sinking lodge to replace logs and build a foundation. But experts weren’t given free rein as is evident by the dips and rises seen when looking down the roof line. “They wanted everything straight and perfect, but their design wouldn’t have looked right for the building so we made some compromises,” she says. To avoid lost income, all work was done in winter with snowmobiles bringing in workers and supplies over the frozen lake. “Our log builder, Blaire Anderson, had the help of the man who restored Yellowstone’s Old Faithful Inn to help pick our replacement logs,” Caine says. Hands on. Caine has embraced her role as owner and delights in giving each guest a very personal experience. She greets everyone and personally shows them to their cabins. Each night the guests are served a four-course meal with matching wines created by the resident chef, Bruno Georgeton and his pastry chef wife, Kris. Caine encourages mixing and mingling, arranging seating so everyone sits with someone different from day to day. “The first night people are often uptight, nervous and still in work mode. By the third day they’re hugging the staff like old friends and everyone is telling each other all about their grandkids. One guest told me by the third night that she’d never seen her husband more relaxed,” Caine says. Subtle things like a no-phones-at-the-table rule, having to walk to and from their cabins, no televisions and, until recently, a lack of wifi, helped guests disconnect from hustle and bustle of their normal life to instead bond with other people and really take in the beauty of the land around them. Couples, friends, parents and their adult children celebrating life milestones—Caine is happy to share the place of so many happy childhood memories with others in the hopes it will never give way to traditional development that threatens from every angle. Whether it’s subdivision or commercial airplane tours seeking permits on the lake, Caine is constantly working to keep things simple and wild.